During the visit on 17 December 2012 to Tbilisi, Georgia, Mr. Eduard Biriucov, Secretary General of the PS IGC TRACECA met with Mr. George Kvirikashvili, Chairman of the TRACECA National Commission of Georgia, Minister of Economy and Sustainable Development of Georgia and Mr. David Narmania, Minister of Regional Development and Infrastructure. The Parties exchanged opinions and underlined the necessity to develop transit potential of the region, to increase the efficiency of the ITC TRACECA in international transport of goods, discussed the initiative of the Georgian Party on joint operation of railway-ferry terminals between the MLA Parties on the Black Sea and the Caspian Sea. Particularly it was mentioned that the draft Technical Annex (TA) to the MLA defining the introduction and application of a single waybill CIM/SMGS will allow of attracting additional freight flows to the TRACECA transport corridor. Moreover the project will make it possible to develop regular international direct railway-ferry connections between the ports of the MLA Parties (Romania, Turkey on the Black Sea and Iran on the Caspian Sea). During the discussion the Parties arrived at a common view on the necessity of further elaboration of the Intergovernmental Agreement to define the legal basis for the project implementation within the scope of the “Silk Wind”, technical specifications and the block-train multimodal route. It must be noted that the signing of the Inter-Ministerial Memorandum on the principles of joint activity on the development of transport networks and organization of cargo transportation within the scope of the “Silk Wind” Project was held on 28 November 2012, in Izmir with direct support of the Ministers of the participating countries. Its main objective is the provision of a full complex of logistic services in the countries situated along the route aiming at the facilitation and the rise of the TRACECA corridor potential as well as the increase of multimodal transport volumes in the region. 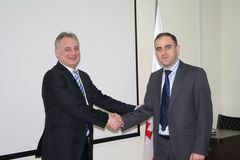 One of the topical aspects of ensuring land transport security is the implementation of a TRACECA-IRU joint project “Model Highway Initiative”, including the Georgian section of the highway Baku-Tbilisi-Batumi-Trabzon. Mr. E. Biriucov underlined that at present “Model Highway” is one of the most promising projects. Taking into account the experience of Georgia concerning the simplification of border-crossing procedures, methods of step-by-step implementation and the outcomes of the initiative will serve as an example for consecutive reforms in other Eurasian countries with the view of developing transport connections. 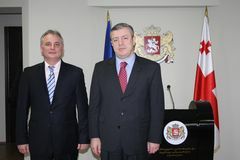 Mister Kvirikashvili noted the significance and interest of Georgia in carrying out the initiative of the Permanent Secretariat of the IGC TRACECA and IRU concerning the need to promote the development of digital maps of roads along the Europe-the Caucasus-Asia transport corridor. Joint Ad-hoc Working Group will work out its recommendations concerning the development of new digital maps and the extension of the existing ones by supplementing them with additional information on basic and auxiliary road infrastructure in the TRACECA participating countries. In the course of its activities the Ad-Hoc Working Group will define the Concept of a cartographic product integrated in global navigational systems and develop a draft Terms of Reference (TOR) for the development of a full-fledged cartographic product “Digital Maps of TRACECA Roads”. Within the framework of the meetings there were underlined the main issues of implementation of the on-going and launching technical assistance EU-TRACECA projects, further improvement of the TRACECA corridor, as well as the Plan of Events for 2013 in the context of the forthcoming Anniversary Tenth Annual Conference to be held in Dushanbe, Tajikistan.